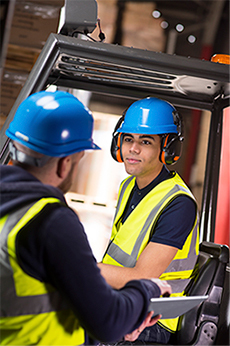 It wasn't all that long ago that lift truck operators were largely on their own when it came to safety, relying almost entirely on their eyes, ears, and best judgment to prevent accidents. But as warehouse and DC operations got bigger and faster-paced, it became harder to maintain forklift safety. Fleet managers and operators needed help, and lift truck makers responded, taking advantage of new technologies and engineering methods to design an array of safety features into their trucks. As a result, today's forklifts are more stable, provide greater visibility, and offer more protection to operators than ever before. As part of our special coverage of National Forklift Safety Day 2017, we asked manufacturers why they think it's important to incorporate safety features into their trucks, and how they decide which ones to add. Along with addressing those questions, they provided some recent examples of safety-related enhancements to their products. Finally, they offered their thoughts about the continuing responsibility of operators and fleet managers to maintain a safe work environment. When it comes to safety, lift truck operators have their work cut out for them. "Today's warehouses and manufacturing facilities are dynamic, at times unstructured environments," notes Mick McCormick, vice president of warehouse solutions for Yale Materials Handling Corp. "Operators must be aware of co-workers, foot traffic, other vehicles, and infrastructure like racking and walls—all while remaining focused on the task at hand." Accordingly, the OEMs take their role in supporting operator safety very seriously. A focus on safety "is a given" in his company, says Mark Porwit, director, corporate planning, for UniCarriers Americas. "It is a part of any new product development, and it's always a top priority," he says. But safety is not just about the product itself, he adds. It's important to design trucks with safety-focused features that "not only assist the operators in their daily tasks, but also assist customers in creating optimal work environments," he says. Lift truck manufacturers have many new tools at their disposal, and they believe it's their responsibility to fully utilize them in the service of safety. "As more technology is introduced to lift trucks—whether that's advancements in electronics or the mechanical aspects of the truck—it would not be consistent with our commitment to looking out for operators' safety if we didn't incorporate that to protect the operator as much as we can," says Mark Koffarnus, director of business development for Hyster Co.
Part of that commitment includes strict compliance with safety regulations and industry standards that affect forklift design and operation. The manufacturers we consulted cited the American National Standards Institute (ANSI)/Industrial Truck Standards Development Foundation (ITSDF) B56.1 standard, which governs safe design, operation, maintenance, and testing of lift trucks, and the Occupational Safety and Health Administration (OSHA) 29 CFR Section 1910.178, which covers similar ground from an operator-safety point of view along with training. Some also mentioned the Underwriters Laboratories' UL 583 standard, which covers electric-powered trucks with respect to risk of fire, electric shock, and explosion. Forklift makers often get involved in developing safety standards and regulations. The Raymond Corp., for one, says it feels so strongly about maintaining the quality of its forklift design that it has representatives on the key committees for ANSI/ITSDF and OSHA standards and regulations. Other lift truck makers also participate in relevant committees, and all of the companies consulted for this article are actively involved in the Industrial Truck Association (ITA), which plays a major role in promoting lift truck safety. (See "Spreading the word on lift truck safety." As the sidebar accompanying this story attests, forklift manufacturers have plenty of ideas when it comes to ways to enhance operator safety. But how do they decide which features to design into their trucks? Customers and the dealers who serve them have an enormous influence. Most of the experts we consulted mentioned "Voice of the Customer"—a standardized market-research process for understanding a customer's needs, desires, and dislikes, and then organizing and prioritizing the findings. "End users are the driving force for any and all of our designs," says Bob Hasenstab, general product manager for Kion North America, whose products include Linde and Baoli forklifts. "We build and design with substantial and extensive customer and driver input." The Voice of the Customer process is extremely important when making a design change to a forklift, says Koffarnus. Through intensive interviews with end users, Hyster learns what aspects they think could be improved. And it's not just current customers who have a chance to offer suggestions; the company also polls users of competitors' equipment. Casting a wider net can have a big payoff. For example, Koffarnus notes that Hyster's Operator Sensing System, which helps operators move safely within the operator compartment, grew out of conversations with users of competitive equipment who were concerned about the rising number of workers' compensation claims and were looking for a different solution from anything available at the time. But not every idea that comes along is—or should be—implemented, says Kevin Krakora, vice president, design, quality, and product support for Mitsubishi Caterpillar Forklift America Inc. (MCFA) and chairman of ITA's National Forklift Safety Day. That's because no change in a forklift's design happens in isolation, he points out. "Before adding any new feature, we consider if an item will have a potential adverse effect on other functions of the forklift as well as other applications," he says. Ron Grisez, director of product safety for Crown Equipment Corp., agrees. "If the features integrated into the forklift will provide a net positive improvement to overall safety of the forklift, then we endeavor to include the feature as standard," he says. "However, if we believe a requested feature could negatively affect the safe operation of a product, then Crown may decide not to allow the feature on our product." Not all safety enhancements should be designed into the truck, Hasenstab notes. Any feature that would affect the machine as a whole—the center of gravity, vibration reduction, noise level, all-around visibility, and so forth—will be designed in, he says. Other types of features, such as speed and lift limits, seat-belt interlocks, and the like, would typically be add-ons and may be optional. All of the experts we consulted agreed that design alone is not sufficient to maintain safety. "Human error cannot be eliminated, so equipment and procedures must be as secure as possible. However, operators and fleet managers are responsible for keeping lift truck operations accident-free, and proper operation still requires appropriate operator knowledge, training, skill, and attitude," says Susan Comfort, product manager, narrow-aisle products, for The Raymond Corp. In an increasingly automated world, though, complacency about safety is a growing concern, says Raymond's John Rosenberger, product manager, iWarehouse Gateway and global telematics. Technology can help combat operator complacency; for example, alarms can be used to warn of a potential problem and draw the operator's attention back to the task at hand, he says. Rosenberger adds that his company is making these alarms more proactive so they warn the operator earlier of possible safety issues. Another useful tool is a fleet management system, which gives end users access to objective data regarding the safe or unsafe operation of the forklift and the vehicle's condition, says Crown's Grisez. "End users can help avoid complacency by actively using this available data to have real-time discussions with operators, so that performance and safety can be improved," he says. "The same data can also be used to recognize and reward operators who consistently demonstrate safe behaviors." McCormick says using an asset management system, such as his company's wireless Yale Vision product, to continuously monitor and evaluate operators' adherence to safety protocols "is a reliable avenue to keep safety procedures top of mind and stave off complacency." But at the highest level, he continues, "the way to help operators stay safe is to create a culture in which safety is always top of mind." That requires education for both operators and pedestrians, he adds. Grisez believes a core part of a safety culture is ongoing training at multiple levels of an organization. He's not alone in that thinking: The ANSI/ITSDF B56.1-2016 standard now includes new requirements for fleet supervisors, he says. Under the revised rule, supervisors must be trained in how to reinforce safe operator practices and compliance, and to correct unsafe operator behavior or performance that does not conform to the standard, he explains. For training to have the greatest beneficial impact, Krakora says, operators and fleet managers should make it a practice to continuously observe and evaluate how end users perform. "Operators and fleet managers should look with a critical eye at their applications and work environments and ask 'what if' more often," he advises. "This will help them to be proactive in identifying risks—and then they must be diligent in determining how to reduce those risks." Still, more direct control may sometimes be necessary to avoid overconfident operation, suggests Kion's Hasenstab. Various limits can be automatically enforced and improper operation prevented, he says, citing the examples of systems that link lifted weight and elevated height and automate travel-speed reductions to match conditions like load weight and forward, backward, indoor, and outdoor motion. "As these systems are costly, management has to take ownership of the issues and implementation," he cautions. Even as forklifts incorporate increasingly sophisticated safety features—often at customers' request—the customers themselves may be making it more challenging for OEMs to fulfill safety goals. "They want more productivity, but faster and bigger is not necessarily safer," observes Koffarnus. "That is why we focus on controlled performance: helping them to be as productive as possible while still being as safe as possible." Nevertheless, as many of the OEMs noted, end users ultimately are responsible for ensuring safe operation. Koffarnus compares it with driving a car. "As much as technology like backup cameras and sensors helps with safe operation, the onus is still on the driver to safely drive on the road." We asked the forklift manufacturers consulted for this article to provide an example or two of safety features they've designed into or offer in conjunction with their lift trucks. The examples below are just the tip of the iceberg; there are many, many more safety-focused products on the market from these and other OEMs. Yale Materials Handling Corp.'s Yale Vision wireless asset management system includes restricted access so only properly trained operators can use equipment. It can also be used as a coaching tool, enabling managers to track operator behaviors and encourage safe operating procedures. Yale has also released a virtual reality forklift simulator that lets operators test their skills on a stationary truck before they start operating mobile equipment. The training simulator can also be used to reinforce safe driving habits for all drivers. Audible warnings that remind the driver to engage the seatbelt before startup and to engage the parking brake when leaving the seat. The Raymond Corp.'s iWarehouse telematics system includes numerous safety-related features, such as an integrated multifunction display that presents only information that is pertinent at that time; for instance, when lifting, the display will only present the camera view. Text-messaging capabilities can only be accessed when the forklift is stationary. Raymond has also introduced a virtual reality program that converts any of its lift trucks to a training simulator, helping new forklift operators become comfortable with the vehicle and its controls before operating in the warehouse. Mitsubishi Caterpillar Forklift America, which also includes Jungheinrich brand trucks, incorporates numerous standard safety features into its forklifts, such as forward LED work lights and audible travel alarms. Other key features include its proprietary Presence Detection System, which activates whenever the operator leaves the normal operating position, and a bright orange seat belt, which allows managers to more easily see at a distance whether the seat belt is in use. Kion North America, provider of the Linde and Baoli lines of lift trucks, has designed a truck-mounted warning light that produces a bright blue spot on the floor, indicating to pedestrians that a forklift is nearby. "Invisible" safety features that are integral to Linde's trucks include a low center of gravity, even weight distribution, and low vibration and noise levels. Visible features include ergonomically driven designs, comfortable operational controls, and a triplex mast rail that reduces visual obstruction compared with conventional side-by-side rail setups. The Hyster Stability System incorporates a mechanical device that uses gravity to optimize steering articulation and reduces truck lean, helping to protect the operator from tipovers. Brand new this year is the Hyster Operator Sensing System, which uses light emitters and sensors to keep the operator safely within the confines of the truck while still permitting free movement during truck operation. Software interlocks confirm operator entry, positioning, and exit; if safe boundaries are violated, the interlocks will reduce or halt truck functionality. Crown Equipment Corp.'s standup counterbalance and straddle lift trucks have been designed with the operator positioned in a "side stance," allowing him or her to maintain a clear view of the direction of travel to avoid colliding with fixed objects, other vehicles, and pedestrians. Floorboard pedals/sensors independently position the operator's feet within the operator compartment during operation. Additional safety is provided by the entry-bar safety switch at the compartment opening, which slows the truck to a stop and sounds an alarm if the operator attempts to drive the truck with part of his or her foot resting on the ledge. Feedback: What did you think of this article? We'd like to hear from you. DC VELOCITY is committed to accuracy and clarity in the delivery of important and useful logistics and supply chain news and information. If you find anything in DC VELOCITY you feel is inaccurate or warrants further explanation, please ?Subject=Feedback - : Safer by design">contact Chief Editor David Maloney. All comments are eligible for publication in the letters section of DC VELOCITY magazine. Please include you name and the name of the company or organization your work for.